Just in time for Christmas, we’re happy to announce the launch of GenuineBijoux, featuring jewelry designs by Janine Horak. At Genuine Bijoux you’ll find gorgeous earrings, pendants, and necklaces created by an artist for the discerning jewelry enthusiast. 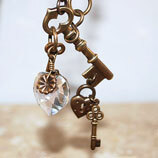 Our timeless designs make the perfect gift, for your sweetheart, friends or even for yourself. Don’t have the perfect gift for your friend or loved one? 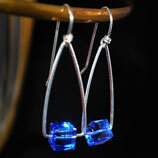 Genuine Bijoux offers a range of unforgettable jewelry, sure to make any woman feel appreciated. 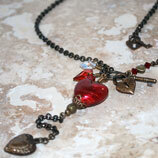 Stunning Murano Heart beads will show your affection with flair. If you’re looking for a little sparkle, Swarovski crystal beads will steal her breath. 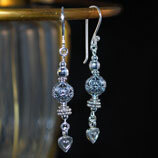 The pure beauty of sterling silver accentuates the crystal and glass beads it adorns. Our impeccable quality and unparalleled creativity make it the kind of jewelry she’ll treasure for years to come. The Genuine Bijoux collection contains jewelry ideal for any event. Need a show-stopping work of art? Janine’s exquisite designs will grab the spotlight. Just want to have fun? Genuine Bijoux has that, too – express your inner self with our light-hearted, original styles. All jewelry is individually fashioned with the utmost care. 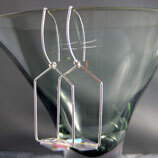 Every piece is slightly different, as is every woman who wears a Genuine Bijoux design. In celebration of Genuine Bijoux’s launch, we’re offering a 5% discount on all orders, PLUS free shipping for orders over $100 to the continental USA. Join in on the festivities and take advantage of this special offer today! Offer Expires December 12, 2010. 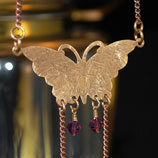 Genuine Bijoux is all about authenticity – of spirit, of mind, and of heart. Be true to yourself and your loved ones with our unique designs. Featuring quality materials, exacting standards, and artistic flair, you’re certain to find cherished treasures here at Genuine Bijoux.